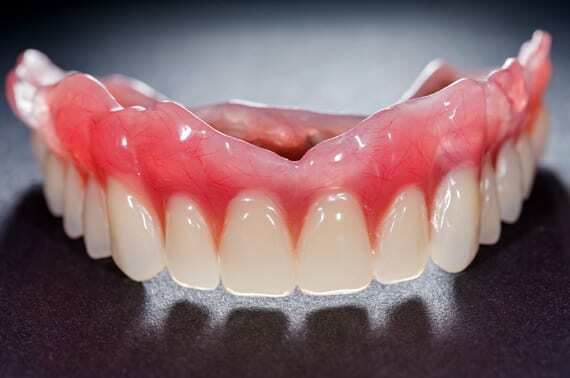 Dentures are an artificial prosthesis to replace one or more missing teeth. They are usually the most cost-effective option and can be made from plastic acrylic material or metal, and can either be partial, replacing some teeth, or a complete full denture, replacing all teeth. Dentures can help to restore function and aesthetics as well as keeping other teeth from drifting. They allow you to enjoy your favourite foods, as well as providing support to your facial muscles, essentially preventing the sunken look. At Emerald Dental Care the dentures are made as natural looking as possible, restoring that confidence smile and aesthetic appearance of the face. If you have missing teeth and would like to know more, book in for a consultation with one of our qualified dentists.